Sure, you can buy hummus at the store. But homemade hummus breathes great natural flavors your guests won't soon forget. 1. Heat oven to 350°F. Cut 1/2-inch slice off top of garlic bulb. Drizzle oil over garlic bulb. Wrap garlic in foil. Bake 50 to 60 minutes or until garlic is soft when pierced with a knife; cool slightly. 2. Squeeze garlic into food processor. Add beans, reserved bean liquid, lemon juice and salt. Cover and process until uniform consistency. 3. Spoon dip into serving dish. Sprinkle with parsley. Serve with gluten-free crackers or vegetables. - Always read labels to make sure each recipe ingredient is gluten free. Products and ingredient sources can change. 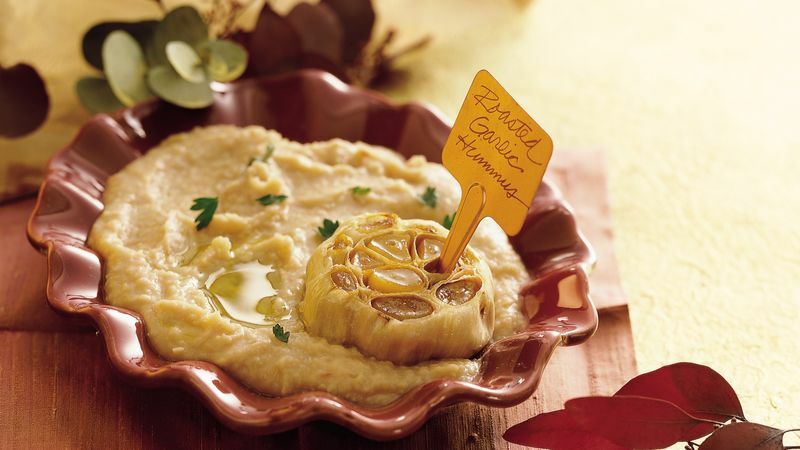 - Roast an extra bulb of garlic to serve with the hummus. - Prepare this popular dip up to 1 day ahead of time. Cover and refrigerate until serving.